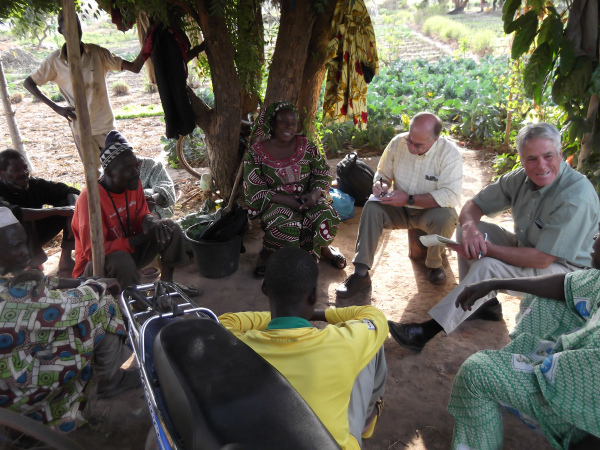 Scott traveled to Mali in 2012. 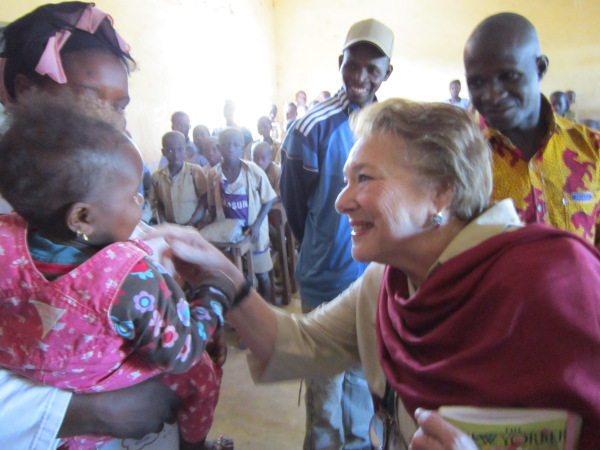 Our volunteer activities in Mali were on hold for the last few months while the country was in distress, but we are glad to see that the situation has improved, and we can now resume activities in the stable parts of the country. It is a beautiful, lovely place, and we hope for nothing but peace moving forward. Winrock Farmer-to-Farmer volunteer Anais Troadec traveled to Guinea in Nov/Dec 2012 to provide organizational development training for rice growers cooperatives/unions and beekeeping cooperatives. 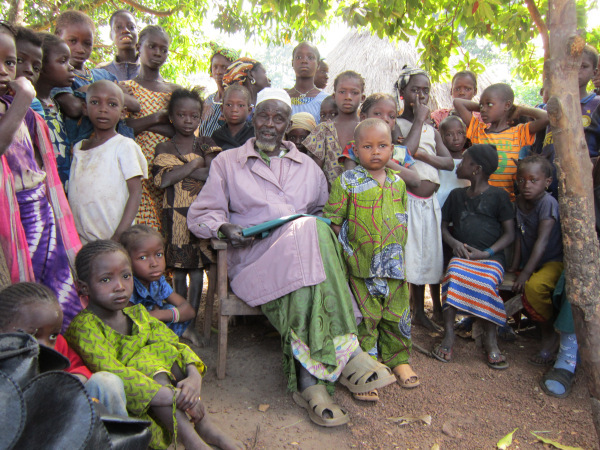 During her time in Nialya, Guinea, she formed strong bonds with the women, men, and children in the village. Inspired by her trip, Anais returned to the US and spoke about her assignment at a meeting of the Hot Springs Village branch of the American Association of University Women (AAUW). Before her eyes, her inspiration led to others’ inspiration… and the AAUW group, in turn, made a donation of over $1400 to support the kids in Nialya! Anais and Winrock field staff will work with the community to put together a plan for how to allocate the funds. In the meantime, let us be grateful for Anais’ passion and service, and for the compassion and generosity of the AAUW members who also wanted to contribute to improving lives. Thank you!! These smiling faces inspire us, too. Here’s another personal blog entry from volunteer Dave Pearce from his trip to Ethiopia. Taking a moment to soak in the culture is always an important part of every volunteer trip. Sometimes, the simplest things are the most memorable! One of my biggest joys and memories while volunteering in Ethiopia was the Saturday / Sunday notion of the Traditional Coffee Ceremony. It’s tremendous– It’s wonderful– If you like coffee! Close to noon, the platform is prepared– ladies scatter freshly cut grass and add beautiful flower petals- as they add both color and class. Atop the grass sets the small coffee table holding little cups, sugar, saucers, spoons, spice, and service for 8 or more. Add a small, but HOT fired stove, the Ethiopian Jebena (round clay) Coffee Pot, a special settling stand, a popcorn dish, Mulu and our ceremony can begin. Fresh green coffee beans are poured into a dish-like skillet. The mokecha (a hooked metal stir) to roll back and forth each bean for proper roasting. The wonderful coffee aroma begins to rise from the roasting beans–ummmmm um! The beans are popping and Mulu rakes and stirs constantly. The aroma intensifies. 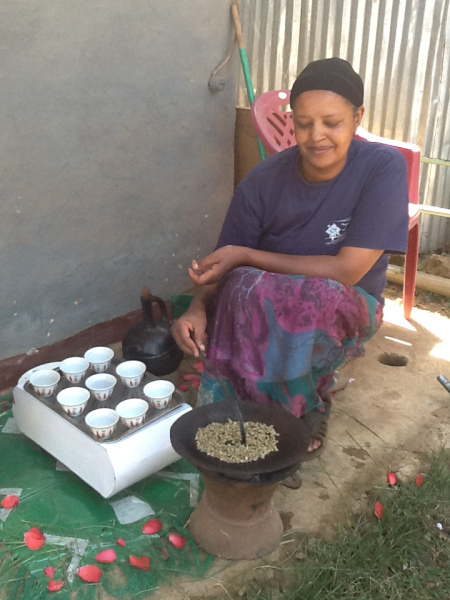 At just the right moment, Mulu sweeps the beans from the hot plate to the cooler saucer. I get the first full whiff! Ohhhh la la! What a wonderful aroma! The next step involves a mortar and pestle like tool to grind and ready the beans for the jebena pot. At the same time, Mulu starts the popcorn in an aluminum kettle much like used in America. The freshly roasted and ground beans are poured into the jebena and placed back on the fire and brought to boil. Once boiling, the pot is then removed and set aside to allow the grounds time to settle. Enjoying the freshly popped popcorn–Mulu carefully pours the rich coffee into the cups, avoiding any grounds from pouring from the jebena into the cups. Mulu adds a little sugar, a sprig of Hyssop (as a stir)– and the service begins. WOW oh WOW Starbucks, Dunkin’ Donuts, Gevalis…. None of these hold a candle to Mulu’s Ethiopian Coffee! Looking back on all of the great work our volunteers have done with women around the world, one of the programs that stands out in our minds is our USAID-funded Partnership for Safe Poultry (PSPK) program in Kenya, which, like our other Farmer-to-Farmer programs, fielded US volunteers to provide training and assistance to farmers, agribusinesses, government agencies, and others. Though the PSPK program has ended, the impacts are still apparent. We are constantly inspired by these stories. Thank you to all of the volunteers who have worked so tirelessly to benefit the lives of women (and men) all around the world. Happy International Women’s Day!